While Clifton Park is known as the land of chains, Troy is known for the exact opposite: small, family owned businesses that you’d hear very little about if you didn’t go digging around. Muza Diner is such a place. As a matter of fact, I passed this location every day for five years on my way in and home from graduate school at RPI; it is located at 1300 15th Street in Troy, just a few blocks down from RPI. Cassie suggested this restaurant a few weeks ago, and we meant to go on Black Friday, but they were closed for the holiday. We cashed in the raincheck on 12/1. I was thoroughly pleased. The menu is classified as European-American, but I believe the majority of the menu is based around Polish and German cuisine. The menu is fairly short, but considering the fact that the kitchen is no bigger than a standard home kitchen, this is understandable. As we entered the building, we were greeted by a young lady who we later discovered was the owners’ daughter. The main dining room is actually split; the ground level can be seen in this image, and above and to the left of the wall in the image, is a small flight with 3 small tables. The moral of the story is that it is a very small place that makes you feel at home (in fact, the glasses used to serve our beverages were of the same dimensions as what I use in my home). The owner peered out from the kitchen a few times and introduced himself to some of the other tables. So being that the menu was short, I wanted to get a sampling of as much as I could during my visit. 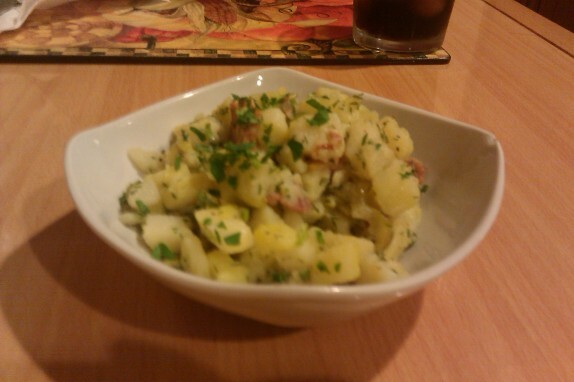 Cassie and I started with their German potato salad. The chef seemed to play it safe with seasoning, as I feel it could have used some salt. Considering bacon and dill pickles were components in the dish, I can understand the hesitation to add more seasoning, but, while this was good, for me, i would have enjoyed it with a little more salt layered in the dish. For dinner, I opted for the Muza special, which is advertised as Stewed beef goulash sandwiched between two large potato pancakes, topped with beef gravy and a side of sauerkraut. I opted out of the sauerkraut and requested white rice instead since I’ve never been a fan of tha’ ‘kraut. I figured this would get me to taste the goulash and the potato pancakes in one swoop. It was very good. I never tried goulash before. It reminded me of an under-spiced Indian beef curry. 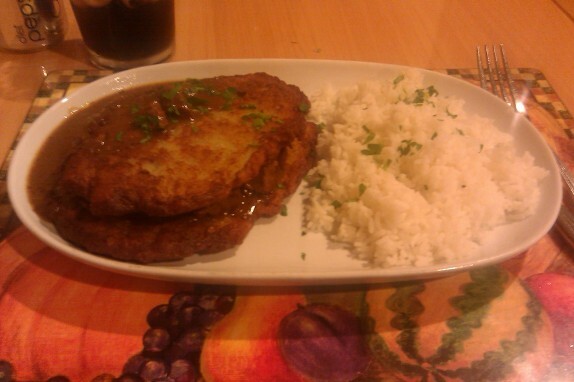 The potato pancakes were nice and crunchy and provided a nice flavoral and textural counterpoint to the beef stew with gravy. The white rice was cooked perfectly, and I am a sucker for perfectly cooked white rice. The dessert selection is basically a bunch of filled crepes. We ordered two chocolate banana hazelnut crepes. 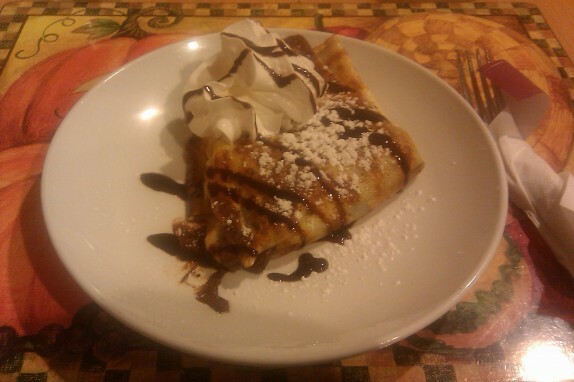 They were obviously made and filled to order, as it not only took a good while to arrive, but the crepe was slightly crispy. I also noted that there was a mixture of Nutella and melted chocolate inside, as you can clearly distinguish an interface between the two. It was a very delicious end to a very delicious meal. Now that I am in the process of writing this, I am digging more into their website and see that they have an outdoor patio, which they call a Beer Garden, and have a decent handful of imported beers on the menu. Although I generally do not enjoy dining outdoors, curiosity would definitely get me to go back to check out the beer garden. In the very least, I know that any food I order would be homemade to order and good! Who was your research advisor at RPI?